The bridge exercise is one of the few exercises that I have the majority of my low back pain and core strengthening patients perform. The reason for this is simple: it is relatively easy to perform, rarely increases low back pain, and has numerous progression opportunities. 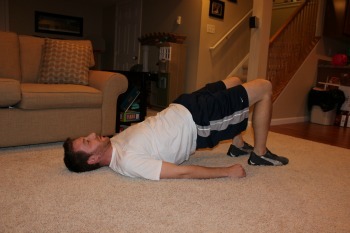 If you are unfamiliar with exactly what the bridge exercise is, it is quite simple. Lie on your back with both of your knees bent to approximately 90 degree angles. Now, slowly lift your buttocks off of the ground and hold. Thats it! It is an effective exercise because it incorporates numerous muscle groups into one movement. Your glutes and hamstrings are contracting in order to help elevate your buttocks, your abdominals contract once you reach the top, and your quads even kick in a little bit to help stabilize. This page will guide you through the main variations you can make from the standard bridge position and will hopefully give you some ideas of exercises to add to your golf fitness program. 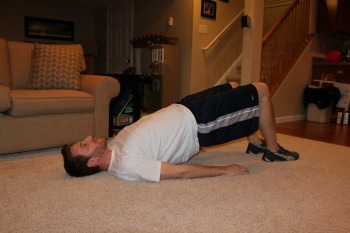 I already described the standard position above, but the key to the exercise that I did not mention is the hold time. This will depend on your fitness level but a solid 5 to 10 seconds is a good place to start. For additional variations, keep reading! -Perform the standard bridge, but really emphasize the abdominal squeeze at the top. Try to imagine pulling your belly button in towards your spine. A pelvic tilt is something that many people have difficulty performing despite the little bit of movement that is actually involved. To understand a pelvic tilt, think of the natural curve of your low back. To increase the curve of your back you pelvis needs to tilt forward, or anterior. To flatten out the curve of your back the pelvic rotates backwards, or posterior. Have good control of this region is a product of core strength and general flexibility. 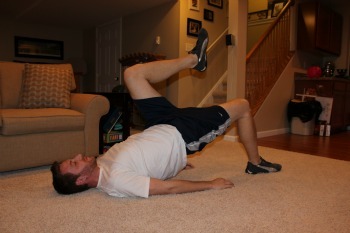 For this exercise however, we will only focus on the posterior tilt. -Perform the standard bridge but once your reach the top and hold, perform a posterior pelvic tilt by tightening your abs and flattening your back. Low your buttocks are repeat. *This can be tricky because your body naturally wants to go into an anterior tilt at the top but work on it until you master it! 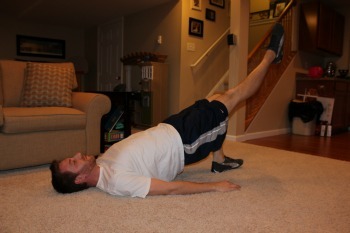 -From the standard position, slowly straighten your right leg and then return. Follow this up by straightening your left leg and returning. Keep your buttocks elevated until both leg kicks have been performed! -With this exercise you can either continue to performing leg kicks while your rear end is elevated, or you can lower your buttocks after each round of leg kicks for a slightly easier version. -Similar to above, but instead of straightening out your legs, bend at your hip and pull your knee to your chest like a march. Alternate sides of course! -Same rules apply as the knee extension variation: either maintain the bridge and continue to alternate sides or lower your rear end after performing both a left and right march.